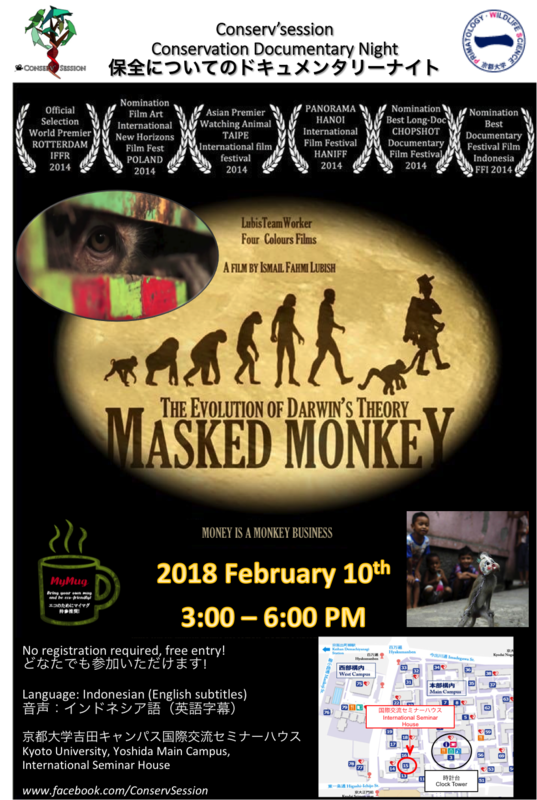 On February 10th, we will screen the documentary “Masked Monkey – The Evolution of Darwin’s Theory” (2014, 110 min), at Kyoto University, in Indonesian with English subtitles. The film, shot in Jakarta, shows the appalling conditions of both humans and animals involved in a (sadly) very common business in Indonesia: monkeys wearing masks and being trained for entertainment in street performances. After the movie, we will open a discussion about the current situation of street monkey performance and the use of animals for entertainment in Japan and abroad. The discussion will be bilingual (Japanese and English). The event will be held in the International Seminar House of Kyoto University’s Yoshida Main Campus (京都大学吉田キャンパス国際交流セミナーハウス) from 3 – 6 pm. No registration required, and entrance is free! The documentary is currently not commercially available, so this will be a unique opportunity! Our aim with Conserv’Session is to raise awareness of conservation related issues such as animal extinctions, illegal trade, animal welfare, waste issues and climate change by screening documentaries and inviting expert speakers to discuss about the subjects. Our team tries to organize this event every month. Entrance is always free and the event is open to everybody. We always try to provide free drinks and snacks and leave some time after the discussion for people to meet and interact. Please have a look at our past sessions on the following links and check the flyer (above) for this month’s event.